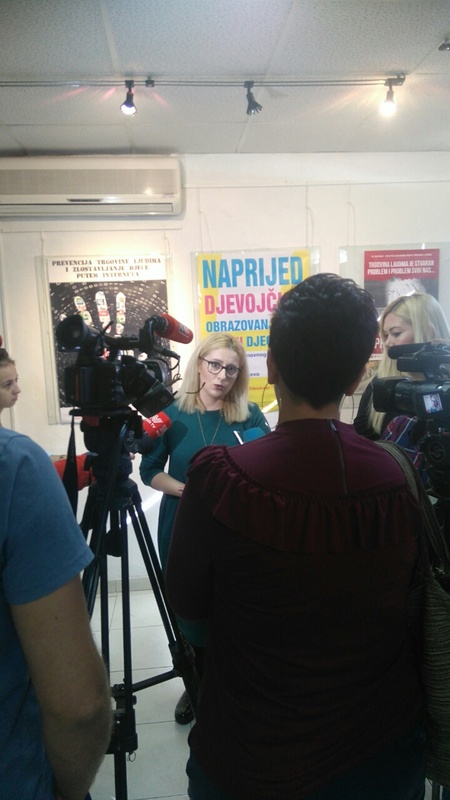 below you will find some more links to the event on marking the European anti-trafficking day by NGO Novi put. I also attached a photo of an article published in the mainstream newspaper Dnevni list. Poster printed with the Rotary Global Grant was in the objective of all journalists thanks to the project's focus on Roma, the most voulnerable comunity in the country. Below is an on line link to one paper's coverage and Director Edisa Demic's opening remarks. Pictures are in available by copying and pasting the link. New Way is the English name though in our grant process we keep the Novi Put name. The Rotary logo appears on the banner behind the panelists. Text is by google translate. Mostar - The "New Way" Association from Mostar on Wednesday organized a panel discussion on the occasion of the Eighth October - European Day for Combating Trafficking in the Culture Center. "The Association The New Way every year marks a symbolic way of showing the general public the problem we face in our society. We have invited all the relevant institutions we work with, with a special focus on the representatives of secondary and primary schools. We also invited our partners and representatives of the regional monitoring team consisting of the Prosecutor's Office, SIPA, the Ministry of the Interior, the Social Work Center and other institutions that are very important in identifying, prosecuting and eventually assisting victims of trafficking in human beings, "said the rortparol of the association Edisa Demić. She added that trafficking in people in Mostar is indeed present. "We all witness that today a large number of children are on the street. And if begging and forcible human trafficking, then we have identified this issue for years and the fact that besides domicile we have an inflow from the families that compel the children to work on the street, "said Demić. During the school year, the "New Way" Association will carry out a large number of workshops aimed at prevention and education. Today we marked the 18th October, European anti-trafficking day in the cooperation with the B&H Ministry of Security. This is very important day since B&H has been identified by the U.S. State Dpt. as primarily the country of origin of victims of human trafficking for various forms of exploitation. Since Novi put has become the leader in prevention of HT in B&H our event has attracted numerous representatives of news media (some of them also broadcasting via satellite to other countries) and we were giving interviews and making press statements since yesterday. I attached some photos to this e-mail and will have some more soon, as we still need to download them from the camera. At the event we spoke about the Rotary funded grant that is being currently implemented by Novi put that is including Roma as the community that is most vulnerable to human trafficking in B&H, and whose children have been subjected to various forms of exploitations both in the country and abroad.